We were honored to have been included at the Brand USA booth at IPW 2018! We had the full 360 degree view- literally and figuratively- at the U.S. Travel Association’s leading international inbound trade travel show. This year, Denver was the host city. Side note: if you haven’t visited Denver, definitely add it to your list! We enjoyed every bit of it. We installed our 360 degree photo booth at the Colorado Convention Center. We set everything up within the Brand USA booth footprint. Most of all, it was an honor to work with the entire conference’s premier sponsor- Brand USA! If you aren’t familiar with the organization, no worries, we’ve got you covered! At Pixperience, we are always on the move between across North America. So, it was very fitting to work with an organization that places such a well-deserved spotlight and emphasis on travel! Among all the fellow attendees we met over the course of the expo, we were pleased to have so many guests visit our booth for some 360 degree interactive #pix! 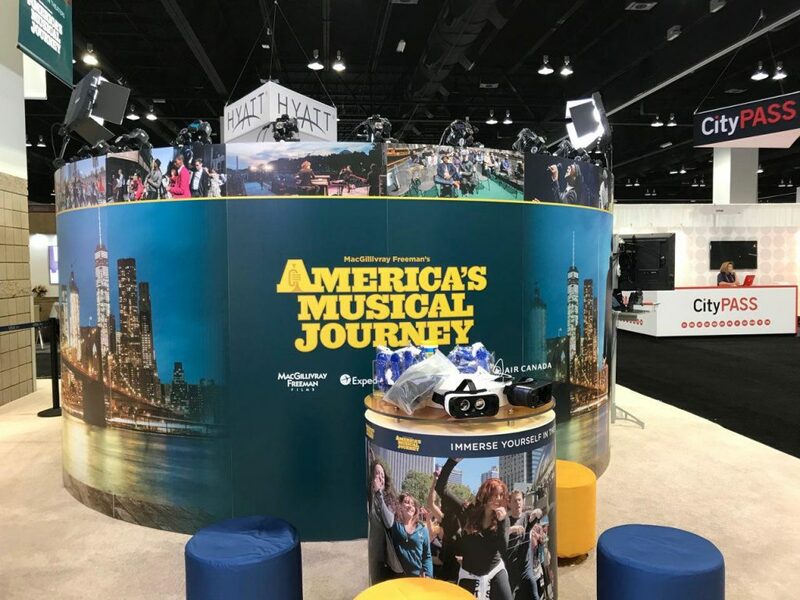 We completely customized the photo booth and branded it as “America’s Musical Journey”, as Brand USA’s tribute to MacGillivray Freeman’s musical. In true musical style, guests posed with microphones and guitars galore as they channeled their inner superstar. Furthermore, it was entertaining to see all of the different poses our booth guests came up with! Want to see some of these awesome Bullet Time photos? Check out the highlights video below!